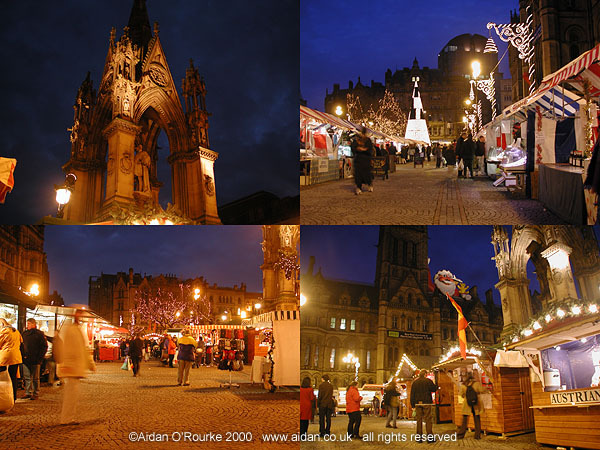 COLD WEATHER FINALLY ARRIVES IN MANCHESTER in mid December 2000, giving the city a feel of Christmas. Down on the Ship Canal, new development continues, though the water is empty of ships or any other vessel. MARKET STREET is busy in the run-up to Christmas - here we see it on Wednesday 20th Dec, looking towards the art deco outline of Debenhams department store (formerly Pauldens and before that, Rylands). On the right, a new retail complex is under construction. On the left is the Arndale Centre, still clad in its ugly yellow tiles. 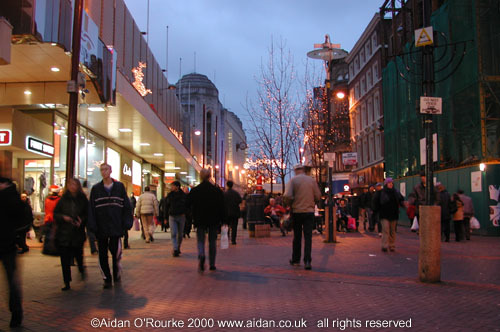 Market Street is to be changed - street traders are to be banned and the place will receive an overall makeover. Eyewitness says: No amount of sprucing up will ever conceal the essential ugliness of the exterior of the Arndale Centre, or replace the rich and varied Victorian building facades which were destroyed in the 1960's to make way for it. If Market Street had been left intact on both sides, it would be the northern equivalent of London's classy and characterful Oxford Street. THE CHRISTMAS MARKET in Albert Square was one of Manchester City Council's success stories in 2000. Traders from Holland, Germany, France and other parts of Europe set up stalls in front of the Town Hall and sold their products, which included delicious cheeses, waffles, Glühwein (mulled wine) and genuine German sausages. Here we see the market on the last day of its operation, Sunday 17 December 2000. It's the run-up to Christmas 2000, and Claudia Schiffer is pictured on the continental style ad column promoting H&M underwear. A good place to buy ladies underwear is Marks & Spencers, just visible on the right. On the left is the Corporation St entrance of WH Smith, in the Arndale Centre. The Arndale and M&S is linked by the futuristic 'cat's cradle' footbridge. It's difficult to imagine now that this scene was at the epicentre of the IRA's massive truck bomb, which three and a half years ago exploded where the telephone box is now. 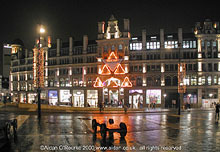 EXCHANGE SQUARE is a creation of the redevelopment of Manchester City Centre in the aftermath of the bomb. More of a triangle than a square, it's overlooked by the Triangle shopping centre (alias the Corn Exchange, left) and the M&S building. The Arndale Centre facade on the east side (right) is still empty. 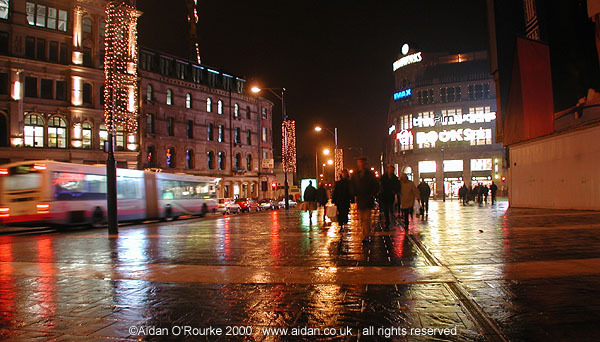 Straight ahead is the marvellous Printworks entertainment complex. EXCHANGE SQUARE is the result of the pedestrianisation of the streets around the intersection of Cannon Street and Corporation Street. Corporation Street cuts across the square - during the day it's closed to general traffic except buses, but after 6.30, cars can drive through. 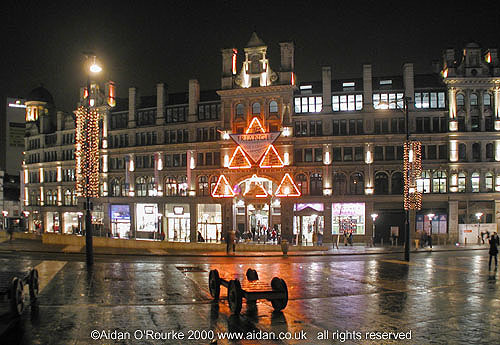 Here we are looking across the square from the Arndale Centre facade towards the Triangle, alias Corn Exchange. The outsize decorative waggons, meant to commemorate Manchester's railway heritage, have been moved from the other side of the square to this one, and still look incongruous. 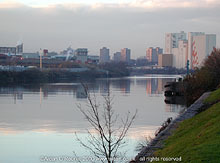 SALFORD QUAYS has since the mid-eighties been undergoing continuous development. The former Manchester Docks are being transformed into a futuristic waterside place of entertainment, apartments and shops. 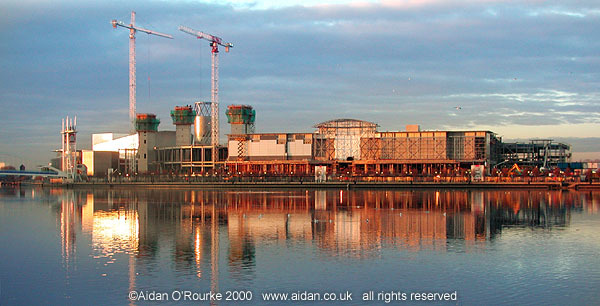 Here we are looking from Trafford Wharf across the widest expanse of the former Docks towards the new Lowry Galleria, a contemporary style shopping centre and designer outlet. It should be completed some time in 2001. THE IMPERIAL WAR MUSEUM NORTH has taken shape very rapidly - such is the speed of modern building methods. The museum is designed by architect Daniel Libeskind and is in the form of a shattered globe. We are looking from the Salford side of the former Docks towards Trafford Wharf. The Hovis grain silo is visible just behind the new museum, spoiling its dramatic outline somewhat. The barbed wire on the right, marking a restricted area, provides a fitting right hand border to this view of the War Museum under construction. The Lowry is visible to the left. THE MANCHESTER SHIP CANAL is now mostly an empty and unused expanse of water. Here we see it looking from just below Mode Wheel Locks on the Salford side. The bank of the canal has been strengthened and planted with grass and shrubs. We are looking towards Eccles. 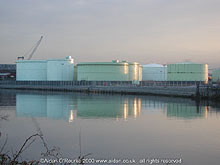 THE MANCHESTER FUEL DEPOT, situated in Trafford, on the south east bank of the Manchester Ship Canal, is seen here from the Salford side, just below Mode Wheel Locks. These cylindrical containers are used to store fuel which is distributed by lorry to petrol stations all over Greater Manchester. RUNCORN BRIDGE is in my opinion one of the unsung wonders of the north west. This beautiful steel suspension bridge is similar to but considerably smaller than Sydney Harbour bridge. Its graceful, curvaceous outline is brightly lit after dark and can be seen for miles around. The Manchester Ship Canal, once ploughed up by ships day and night, is, at 12.30am Saturday 16 December 2000, as calm as a millpond. This is the start of the estuary of the River Mersey, ancient boundary between Cheshire and Lancashire. We are looking from the esplanade of Runcorn, Cheshire in the direction of Liverpool. Widnes is over to the right. This bridge, opened in the 1960's, replaced the old transporter bridge, a working example of which can still be found in Newport, south Wales. ST MARY'S HOSPITAL seen here together with the controversial Opium advert, looking across Wilmslow Road, next to Whitworth Park. We are about two miles (3km) south of the city centre. 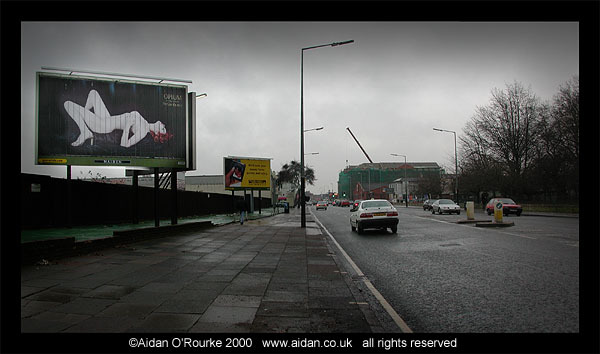 Both the hospital and the advert have been the focus of controversy during Autumn 2000. Conjoined twins 'Jodie' and 'Mary' were finally separated in an operation carried out at St Mary's Hospital, after an extended legal process. St Mary's is a maternity and childrens' hospital. The Opium advert, featuring a naked Sophie Dahl in a languid pose, was finally banned in December after the Advertising Standards Authority received over 700 complaints. The nation is divided - many like it, but disagree on its suitability as a giant billboard ad. Eyewitness says: It's a superbly crafted, tasteful and painterly image of womanhood, and one which appeals to many women - The pose portrays the first flush of sexual arousal, but she could also be at the final stage of the process, giving birth... This ad is inoffensive to most people, and should never have been banned.